UPDATE We now have some more features for VersionEye’s Cocoapods integration. At VersionEye we believe we should make it as easy as possible for developers to get their work done. That’s why we love package managers and that’s why we listen constantly to other developers. Almost every week our users ask us to integrate new package managers and one of the most requested integration feature was the integration of CocoaPods. What is CocoaPods? CocoaPods is a package manager for Objective-C, widely used by iPhone developers. We have learned that for many mobile developers Ruby and Objective-C is a common combination. Usually iOS developers are using Ruby for the server side API and build a native iPhone app with Objective-C or RubyMotion as mobile client. VersionEye supports Ruby gems already for a long time, but until now we were not able to notify users about outdated Objective-C libraries in their projects. Since last week we are finally able to support CocoaPods! Currently, we track 7,861 artifacts from 2,851 projects daily. But those figures are growing every day. Now, we can monitor the whole code base of a client-server application on GitHub. You can find all CocoaPods artifacts through our open search. CocoaPods artifacts with a high number of followers rank higher. Each CocoaPods artifact has its own page on VersionEye and on the right side you will find some KPI’s (Key Performance Indicators). You can follow a CocoaPods project by simply clicking the “Follow” button. As soon the next version comes out VersionEye will notify you via email. 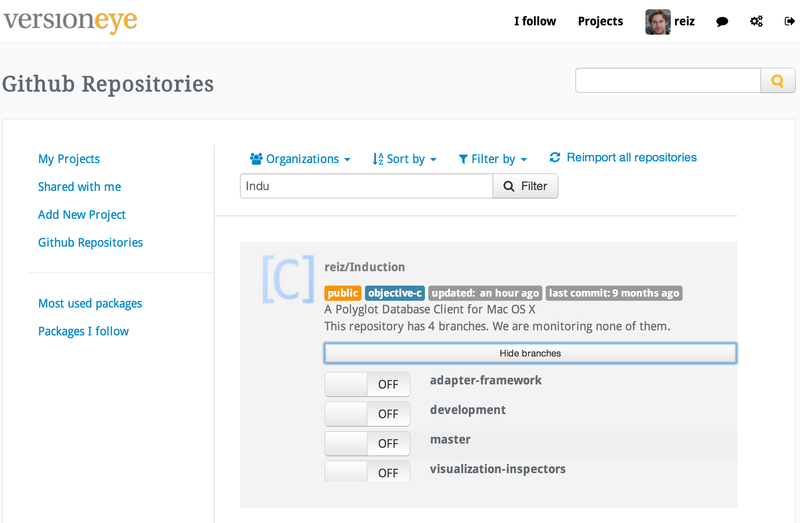 If you are logged in to VersionEye, just navigate to “GitHub repositories“, scroll to your Objective-C repository and turn on the switch of the branches VersionEye should monitor for you. VersionEye will fetch the Podfile, parse it and show you the current status of your Pods. By default it will check your Podfile once a week and notify you per email as soon there are updates available. So you don’t have to look manually for updates and can focus on building new features (or enjoy your free time 😉 ). The CocoaPods integration is a very new feature and currently in beta phase, so we rely on your feedback. Please let us know if you find something odd or if you have further feature requests. Your feedback is very much appreciated!